How many bookmarks do you have saved for blog giveaways that require daily entries? Wouldn't you just love a way to have them all in one place? Well now there is.. let me introduce you to Giveaway Scoop. Giveaway Scoop is a website that has a mass collection of current blog and product giveaways. You can sort them by different ways and see the prizes all at once. Pick and choose what to enter and what not to enter. No more having a folder full of bookmarked sites when now you only need one.. Giveaway Scoop! You can even apply to have your own blog or product giveaway added to their site. Sting-Kill is holding a sweepstakes in which the prizes are 22.5" Weber Smokey Mountain Cooker. They are giving away a cooker every month until Oct. Once you enter simply get five of your friends to enter and unlock your entries. Disclosure:The above link is my personal entry link and I will receive credit if you enter through this link. As we all enjoy our day.. swimming, BBQ, picnics, out on a boat, or whatever your day my bring you please take a second to remember our fallen Military soldiers. For it is their sacrifices that allow us to live the lives we do in a country that was founded and based on freedom. I have an older brother who is in the Navy; while the war on terror continues every day I am thankful that he is still here on this earth with us.. and every day I think about those families who lost someone while protecting us. Fly your American Flags with PRIDE today! For those of my followers that love Diamond Candles as much as I do here is another code for you to save $5 on your next purchase. Valid until Monday June 11, 2012. Just click on the link here to get your code! Choosing a career can be a rigorous, time-consuming challenge that often requires continued education, extra deliberation and a great deal of effort for anyone. The task is especially difficult for mothers. If you have children, you understand the day-to-day hassle of feeding and dressing your little ones, transporting them to and from school, attending their extracurricular activities, helping with homework and just spending quality time with them. Still, it's equally important to earn a living and find fulfillment outside of the motherly sphere. Take a look at some career options that may be an ideal fit for your circumstances. BelleChic is giving you a chance to win a $250 Spa Finder Gift Card! All you have to do is fill out the entry form and share. The more you share the better your chances. Disclosure: The above link is my personal referral entry link, by clicking it I will receive extra entries. Once you enter you will then get your own referral link to share. It's Memorial Day weekend and the weather is nice go out and buy yourself some new summer shoes! But before you go enjoy this 20% off your entire purchase printable coupon from Famous Footwear. Click the banner and print your coupon today! Offer valid until 5/28/12 - Some Exclusions Apply. Are You A Totsy Member? If Not Join Now!! Totsy offers moms on-the-go and moms-to-be access to brand-specific sales, up to 90% off retail, just for them and the kids, ages 0-7. Top brands for mom, baby, and child. Prenatal care products, baby gear, travel accessories, bedding and bath, children's clothing, toys, DVDs, and educational materials are just a sampling of a selection that promises only the best in quality and designer brands. Are you a sweeper and love when a surprise win shows up? I know I do! UPS has a service that notifies you when a package is coming. You can customize your notifications to emails or texts and also when you want to be notified (upon ship, day before delivery, day off, delivery confirmed). I have mine set to text me the day before a delivery.. and let me tell you there have been plenty of times I went bat crazy trying to figure out what was coming! If you haven't signed up for UPS MyChoice you can do so by clicking on the banner or by clicking here! Dislosure:This post is sponsored content through Escalate Network for UPS MyChoice. Calling All Shoe & Fashion Accessory Lovers! If you are a shoe and/or fashion accessory lover and have not joined Shoe Dazzle yet what are you waiting for? I've done a few orders from them and have been very happy with the shoes and boots I received. Actually the boots I ordered are my all time favorite boots to wear. It is FREE to sign up and create a profile. You don't have to purchase to keep your membership. There are NO monthly membership fees and you are only charged for what you order! How much better can that be? So head on over here and sign up for Shoe Dazzle, create your profile, and the let their stylist send you custom selections monthly!.. Disclosure: By clicking on the link posted you will be giving myself credit for referring friends and it will also enter me into the $500 Shopping Spree sweepstakes! Would you like your voice to be heard all while earning rewards redeemable for electronics, toys, giftcards? Here is your chance... Join Nielsen Home Scan Consumer Panel - Earn valuable points, which are redeemable for electronics, household items, jewelry, toy, gift cards, and more. (no landline required with this homescan signup) Click on the banner for more information or you can go here to read more! Enter here - once you get 3 friends to enter through your personal link, you will then be entered into the Grand Prize Drawing. Disclosure: The above link is my own personal referral link, using it will grant me more entries into the sweepstakes. Are you like me and LOVE to change the color or your nails or toenails? How about you'd like to win a new iPad... well if you said yes to both of the above comments here is a contest for you. Summer time is coming and everyone is looking to cut calories, but not taste of their favorite food. There really is a healthier alternative to using high fat oils, butter, or margarine. Filippo Berio Olive Oils are just the thing to use in place of unhealthy items while cooking. It is so versatile you can use it to cook, bake, marinade, as a dressing, and even as a dip for bread. Filippo Berio Extra Virgin Olive Oil contains no trans fat, cholesterol, sugar, salt, or gluten, along with being high in monounsaturated fats (good fat) and has been prove to reduce the risk of heart disease coupled with controlling blood pressure and blood sugar. All of those statistics make Filippo Berio Extra Virgin Olive Oil a win win in my book! High Value! Print before it's gone! In today's busy lifestyle everyone is always looking for simple easy ways to keep their family safe. For solutions to keep track of items that could effect their families well being and over all health. Such as recalls, everyone hates to see on the national news a recall for an item you have in your household, fridge, or freezer. I don't know about you, but it just sends chills through my spine going "oh no did we eat some of that or use that product". Well now a team of 10 developers, designers, and professional problem solvers just made the task of keeping up to date on recalled items 100% easier with the creation of Recalls Plus. 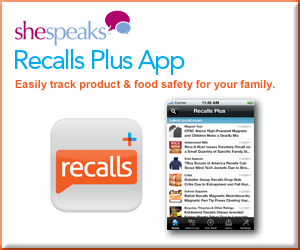 Recalls Plus is an app that allows one to keep up to date on recalled items that could potentially be harmful to your family. This is great for those children's items, such as toys, that keep popping up on our recall lists for what seems to be every week. Now you no longer have to wait and see the recall on the news, but you can check the app and be alerted to them before hand. Even creating a Watch List to monitor the items that concern you. Here I am again... Diamond Candles! My all time favorite candles ever. Not only because there is a surprise ring inside, but the scents are absolutely amazing. Well, they are running a referral contests.. once you enter your email address you can then get your own links to the contest so you too can enter. But for the meantime (yes I'm disclosing I will get credit for you clicking my link) Please use my link to enter and ask your friends to enter. I would love to win this contest! !